You've probably heard legends about "rat kings": rats whose tails are tangled to form a super-rodent more fearsome even than the pizza rat. While many doubt the existence of these skittery monarchs, there has officially, without a doubt, been a squirrel king. We like to think we speak for everyone when we say: what. This is a real thing that happened in Milwaukee last week. According to Fox 6 Now, five juvenile gray squirrels -- siblings, no less -- were brought to the Wisconsin Humane Society's Wildlife Rehabilitation Center with their tails tangled into a "Gordian Knot." Their tails were reportedly "entangled with long-stemmed grasses and strips of plastic their mother used as nest material." Almost more unbelievably, the whole family was saved. After anesthetizing the understandably distressed squirrels, the center slowly went about snipping the grass and plastic off the tails over the course of 20 minutes. As you might imagine, all five had tissue damage from impairment to their circulation. But as of now, they're safe and are being monitored to make sure the rest of the recovery process goes smoothly. 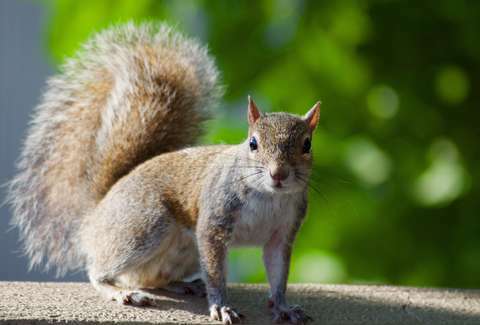 All hail the squirrel king, and may it be the last one ever.